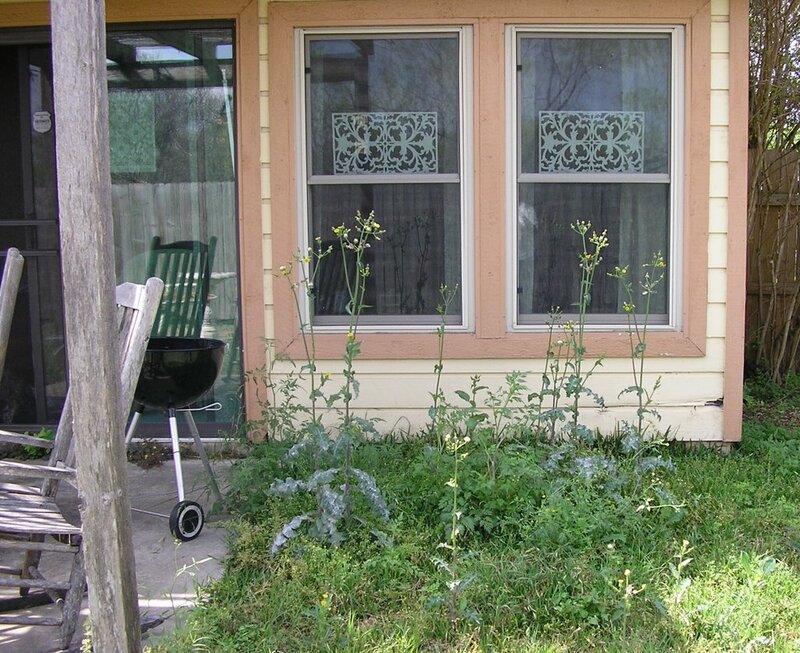 But first -- this is my backyard, outside my living room. See those giant "flowers"? They're dandelions. 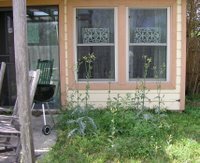 I need to do something about this this afternoon, although, if it weren't for the weeds, there wouldn't be much green in my backyard at all! Actually, my stash wasn't as big as I was afraid it was. I was particularly worried that the wtf? part of it would be huge, but really, it's not so bad. Here's where most of my stash lives. 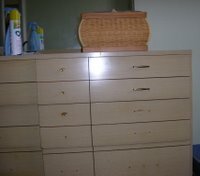 It's a vintage 1950's dresser that was my grandmother's, but now belongs to my sister. 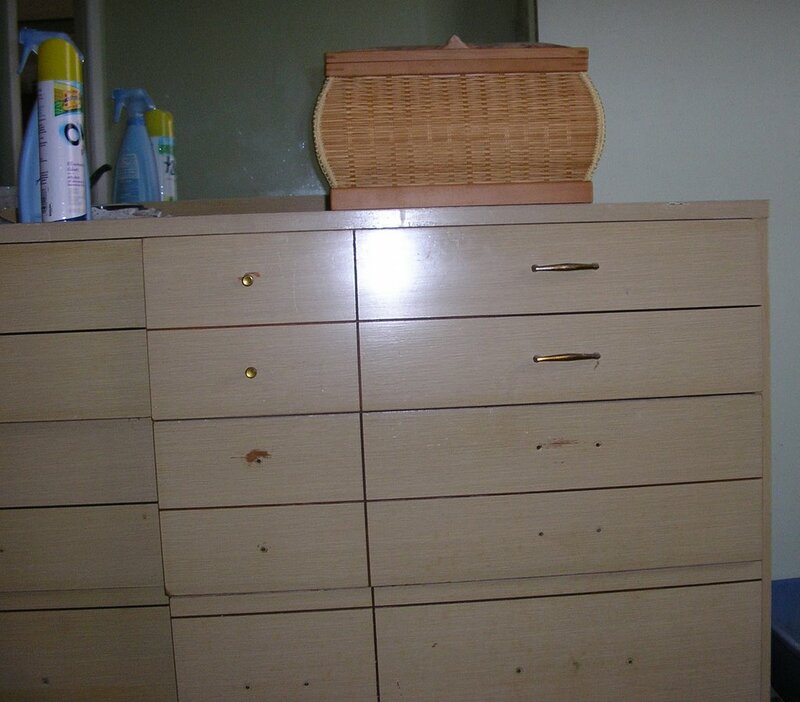 (yes, it's missing some drawer pulls - in one of the drawers is a bag with replacement pulls.) My sister doesn't have room fo it, so it's in my craft room. My stash takes up the right-side drawers that you see here, except for WIPs, which live in my living room in a leather bin next to my knitting chair. As you might guess from the can of Oust, my stash shares the craft room with a large litter box. Here are my current WIPs. 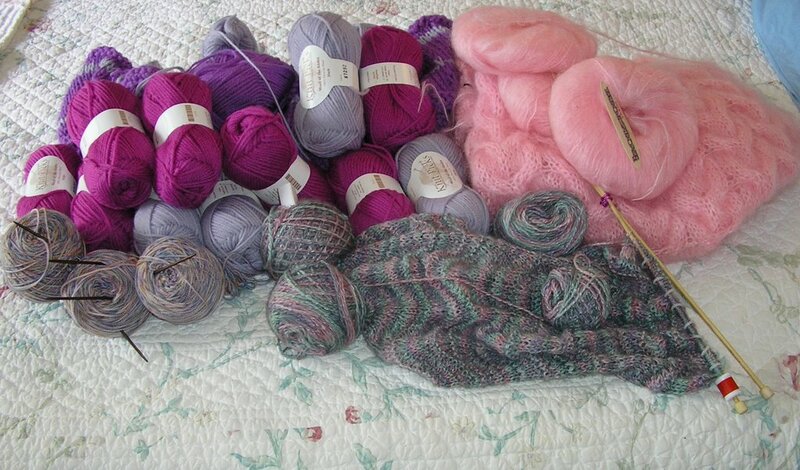 At the back left is a large stockinette-in-the-round bag which will be felted if I ever finish the knitting. I've decided that is has to become the knitting I take to knitting group - it's mindless and it has to get done! At the back right is the bubble gum pink mohair shawl, which I can only work on when it's cold. Unfortunately, our coldest weather this year came during the Olympics, while I was slaving over those socks. Front right is a feather and fan scarf from some yummy Brooks Farm Duet, and front left is Koigu KPPM which are about to become a pair of socks for me. And I just realized that hiding somewhere is a skein of fuchsia Cascade 220, which I've cast on for a pair of the Cable Footies for a friend. 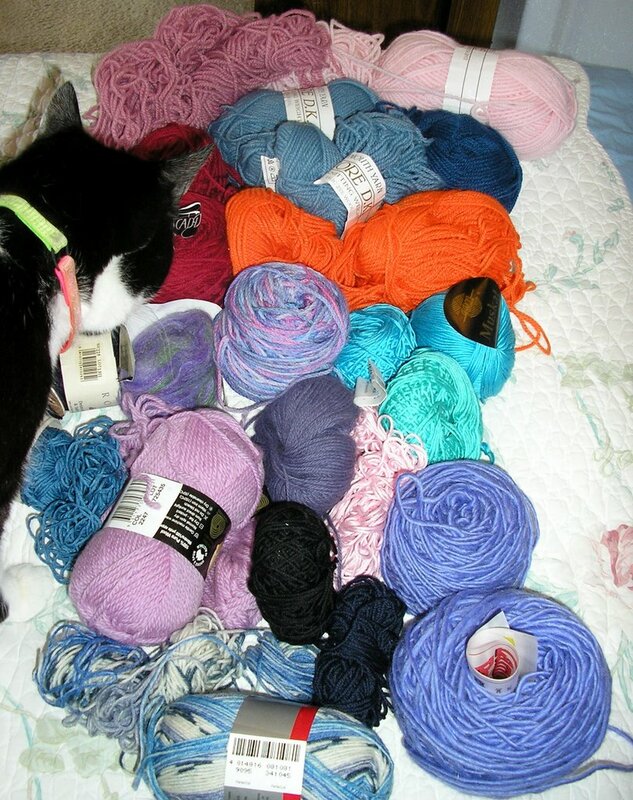 Simon recognizes this yarn - it's all left-overs from FOs. Notice there are quite a few complete skeins in there. 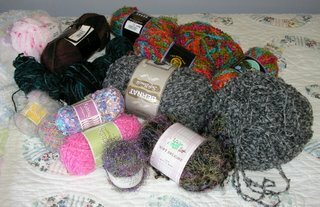 I almost always buy too much yarn for a project. And finally, here's the dreaded wtf? pile. Like I said - it's not as bad as I remembered. 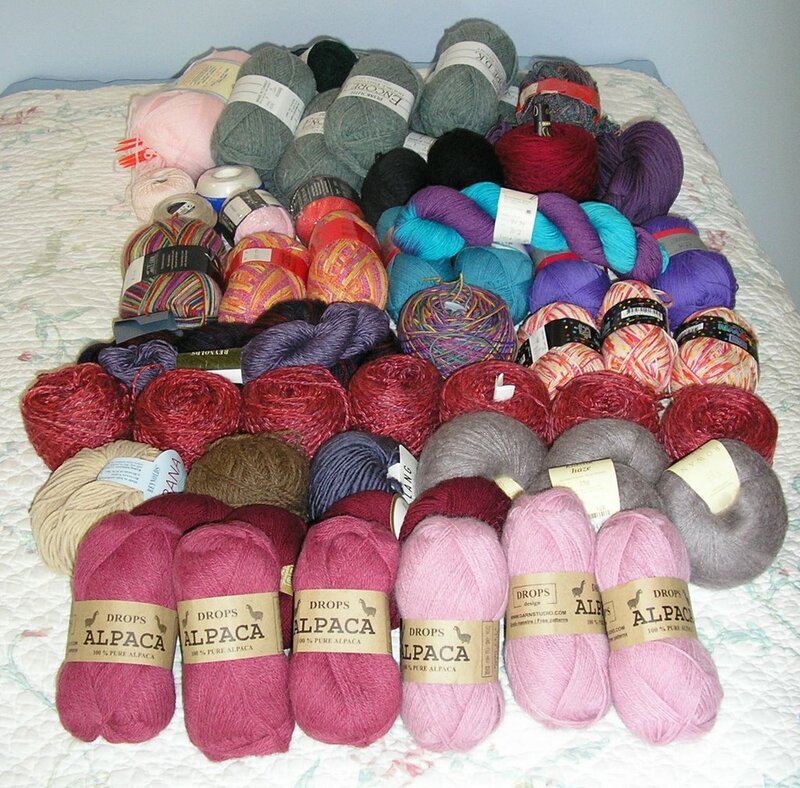 About half of it is from my beginning days as a knitter (see all that Lion Brand boucle'? ), some of it is that $1 yarn from Target which I should have resisted, and some of it I inherited from other people's stashes. Sorry if you see something there that used to be in your stash - but there was a reason you wanted to give it away, right? So that's my stash. Now I need to go look at yours!